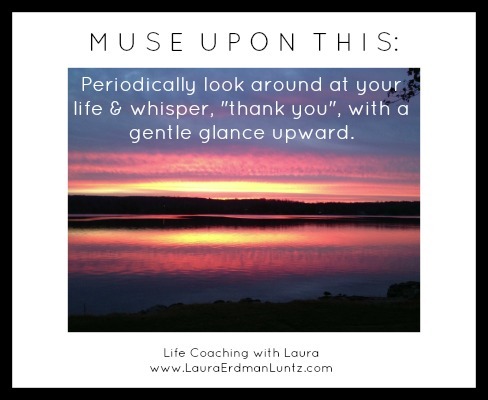 Periodically, look around at your life & whisper, “thank you”, with a gentle glance upward. We are entering the Thanksgiving season here in the States, my favorite holiday. (Anything focused on food and gratitude is a Good Thing in my book!) I find it is a delightful way to enter the craziness of this holiday season, with gratitude rather than a sense of obligation and a soupçon of expectations. Let’s take some time to feel the gratitude this season is about. This photo was taken by me at dawn on Thanksgiving Day last year. I have not doctored it at all and I took it with my phone. Spectacular. I looked around at my life and whispered “thank you” with a gentle glance upward. Tune in next week. I have a special thank you gift for you all! This week’s Feel Good Moment is a special video I have watched several times. It is longer than the traditional videos I usually share. It is worth it. Watch it. Watch it again. Share it with family and friends. Feel your own gratitude swell. Watch it now.